The American Association for the Advancement of Science (AAAS) interviewed Professor Dinesh Manocha on camera about his research at the Annual AAAS Meeting held last month in Washington, DC. The interview appears in the AAAS “Member Spotlight” section and was recently featured in the AAAS newsletter. Click here to read Manocha’s interview in which he discusses his research on robot planning, human-robot interaction, and autonomous driving. 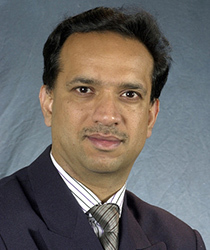 Manocha is the Paul Chrisman Iribe Professor of Computer Science with joint appointments in the Department of Electrical and Computer Engineering and The University of Maryland Institute for Advanced Computer Studies (UMIACS). He is also a Maryland Robotics Center (MRC) faculty member. Manocha represented Maryland with the MRC team that demonstrated bioinspired robots including Robo Raven, Robo Crab, and Tiny Terps, as part of the meeting’s expo events. Click here to read more about the MRC team.